This Friendship Day, show your friend how much you love and care. Every year, we celebrate Friendship Day on the first Sunday of August. This year falls on August 5. 2018. It is on this day of the year when we can honour the bond of friendship and remember the best moments together. It is celebrated all over the world in several different ways but the reason everywhere is the same – to commemorate a special relationship in our life, a friend. They deserve a special place and what can be a better day to celebrate their importance than this Friendship Day. On this friendship day, strengthen your friendship with your best friend. Let your friend know how important they are in your life by gifting them a surprise gift. In the spirit of this festival day, we help you gift your best friend to cherish your wonderful bond. Friendship gifts are the perfect way to celebrate this Friendship Day! Therefore to express this beautiful relationship with friends, Anil has come up with the Surprise Gift Contest. Participate in our Contest & get exclusive hampers for your friend this friendship day. Seal this bond of trust, care and affection and send a surprise gift to your friend by participating in Anil Friendship Day Gift Contest. 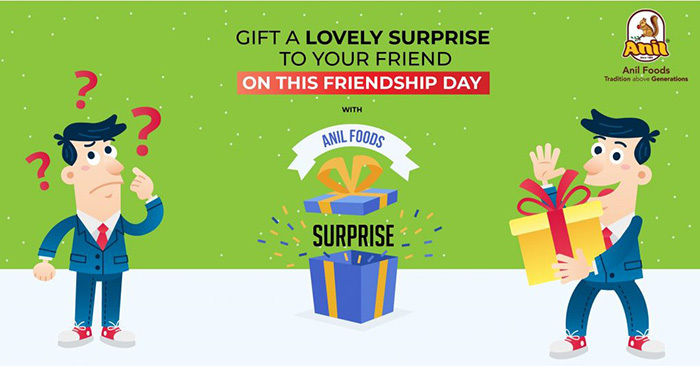 Surprise Gift Hampers from Anil Foods – Anil`s surprise gift hamper of happiness and appreciation is perfect to send to your friend in any city this Friendship Day. Participate now using these rules below to send surprise gift for your friend.